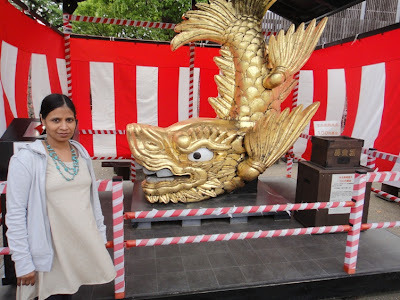 During the golden week holidays, hubby and I visited his ancestral home in Ichinomiya city. 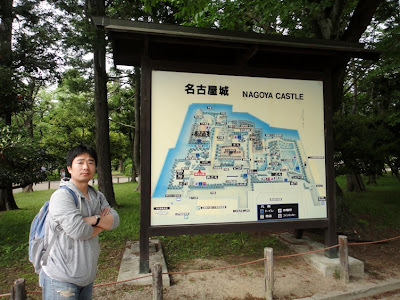 On May 1st, we visited Nagoya Castle located near his ancestral home. 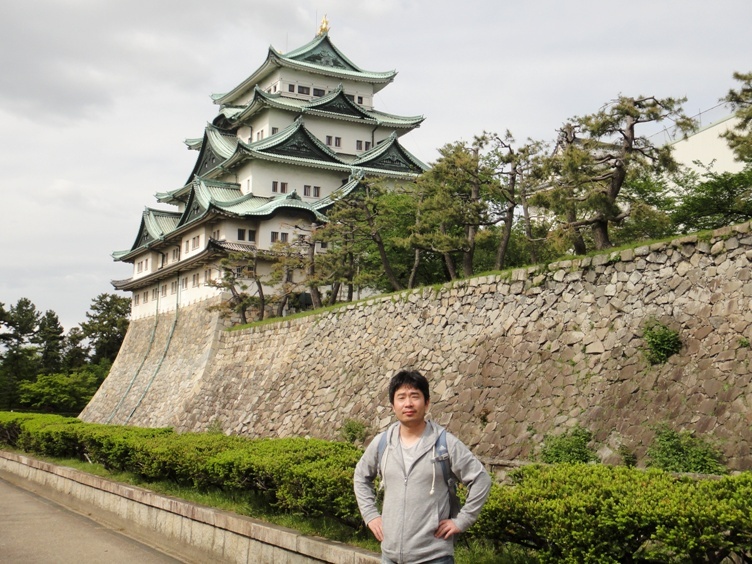 Nagoya Castle is a flatland castle located almost in the center of Nagoya city in Aichi Prefecture. In fact Nagoya castle area had several fortifications prior to the current version of Nagoya Castle. Shiba Takatsune built the first recorded fort at Kiyosu, northwest of Nagoya, in the late fourteenth century. 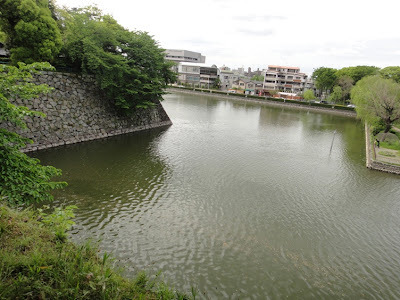 The first castle was built on the present castle site by Imagawa Ujichika of the Imagawa clan around 1525. In 1532, Oda Nobuhide of Oda clan defeated Imagawa Ujitoyo (Ujichika’s son) in a battle and captured the castle. However, the castle was abandoned and fell into ruins. 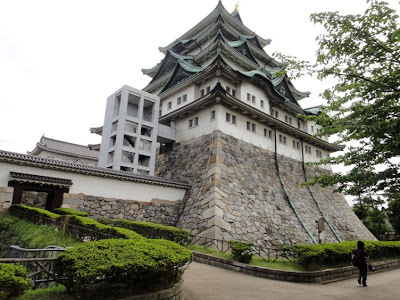 The modern version of Nagoya Castle was constructed under the orders of Tokugawa Ieyasu in order to secure an important position on the Tokaido Highway and to ward off attacks from the direction of Osaka. 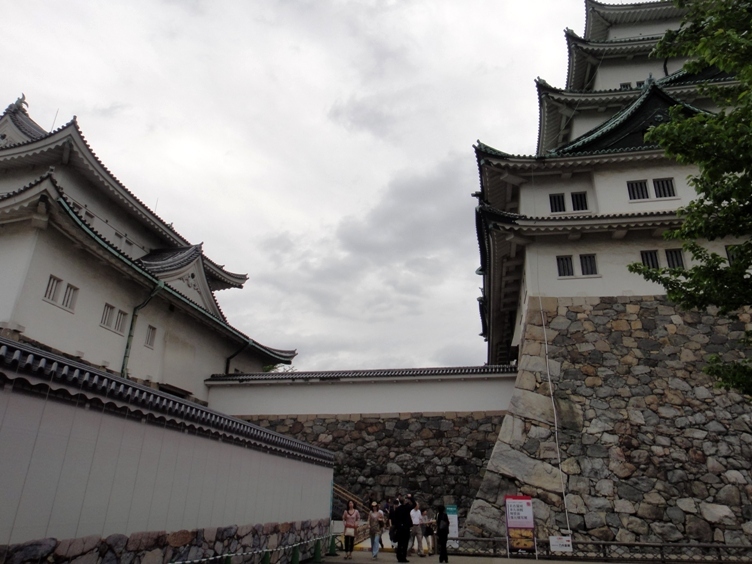 The construction started in 1610, and pieces of the demolished Kiyosu Castle were used as building material. 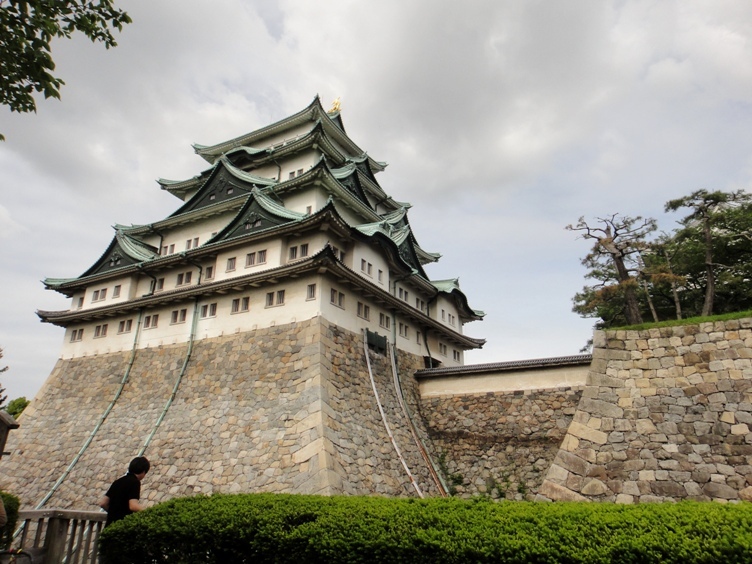 Construction of the donjon was completed in 1612, which was an exemplary castle of those built on flatlands. 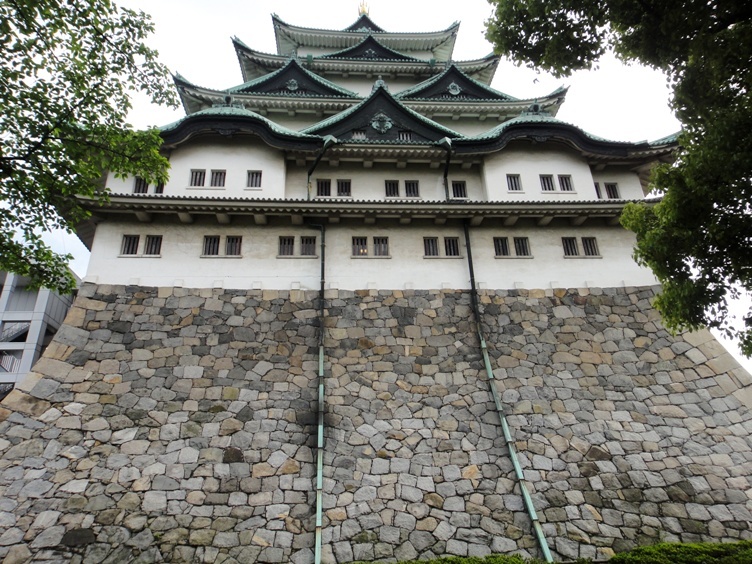 Nagoya Castle flourished as the castle in which the Owari lineage of the Tokugawa clan, the largest of the three Tokugawa lineages, resided. 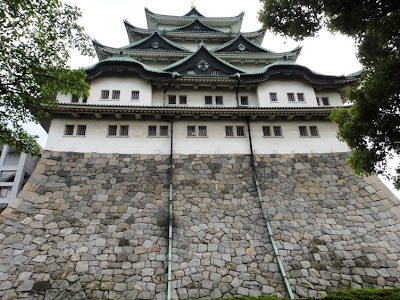 In 1868 during Meiji Restoration, imperial forces seized the castle and used it as Army barracks. It was transferred to the Imperial Household Ministry in 1893, and was used as an Imperial Villa. 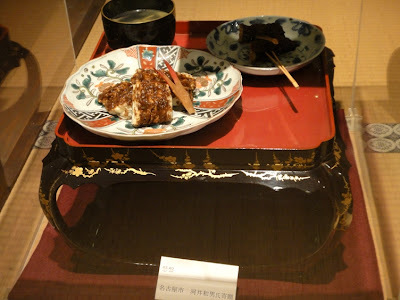 In 1930, the Emperor gave the castle to the City of Nagoya. 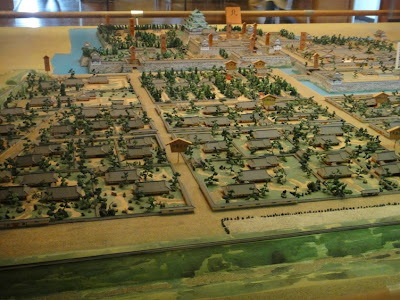 In May 1945, during the air raids on Nagoya in World War II, buildings such as the main donjon, the small donjon, and the Hommaru Palace were burned down. 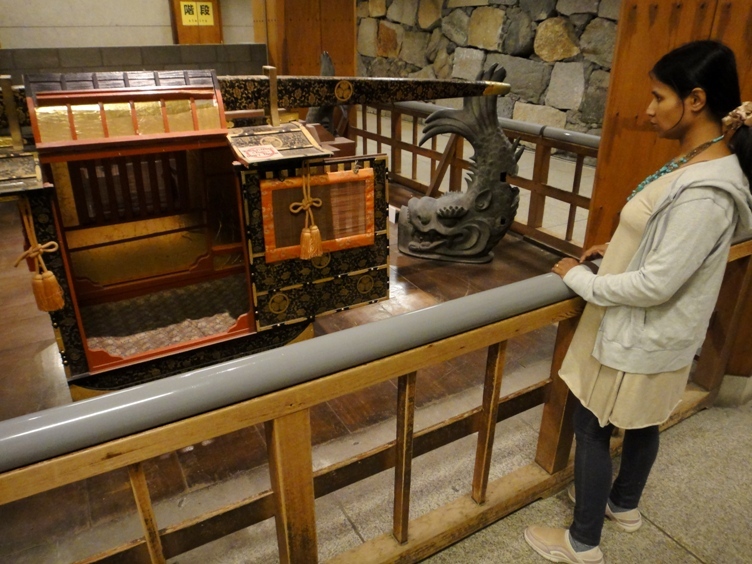 However, three towers, three gates, and most of the paintings on the sliding doors and walls of the palace survived the fire and have been designated as important cultural assets. The main and small donjons and the main gate were rebuilt on the site in 1959. What we see today are these reinforced concrete reproductions of the original destroyed portions. The castle’s main donjon has five levels and seven stories, and serves as a museum. 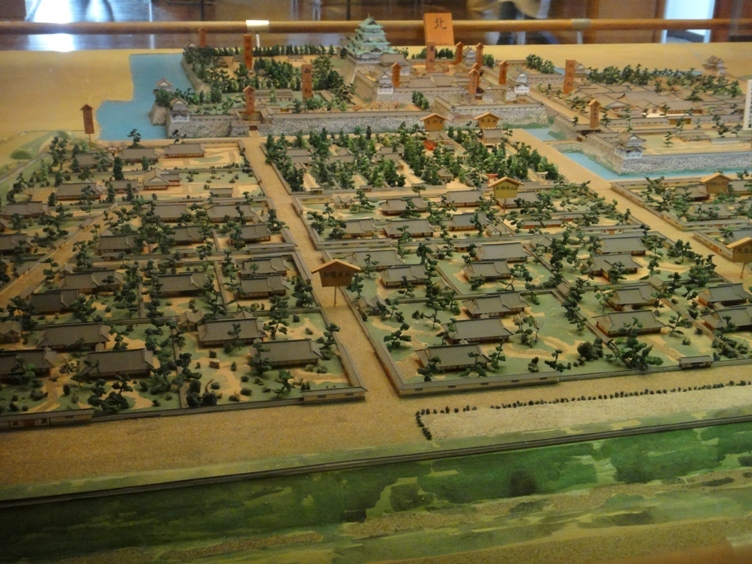 The layout of the castle complex is rather complicated and is divided into various areas. 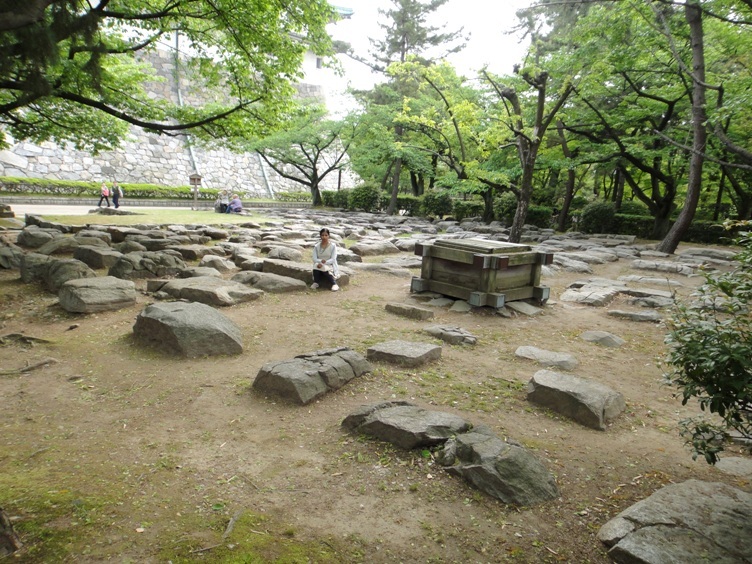 Hommaru area is in the centre of the complex containing the main and small donjons and the Hommaru Palace (presently under reconstruction). Ninomaru area is located to the east, Nishinomaru to the west, Ofukemaru to the northwest, and Sannomaru around the east and south. Nagoya Castle is located about 22 kilometers southeast of hubby’s ancestral home and it took us 45 minutes to reach the castle by car. Hubby borrowed his father’s Audi car and he felt great to drive it. After parking the car at a parking area, we walked for about five minutes to reach the castle complex. 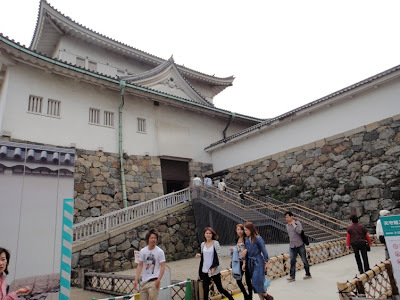 We bought tickets worth 500 Yen per person as admission fee to enter the castle premises. We entered the castle premises through the main gate located at the southwest region of the complex. 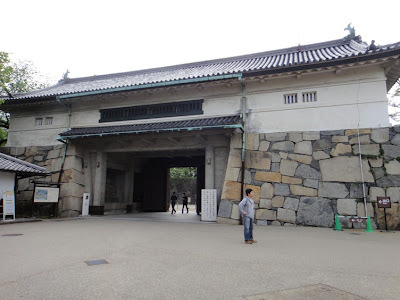 This gate was originally called Nishinomaru-enokida Gate and was destroyed by fire during World War II. The gate was reconstructed in 1959. Inside the castle premises there is a lot of greenery and is so serene and beautiful. 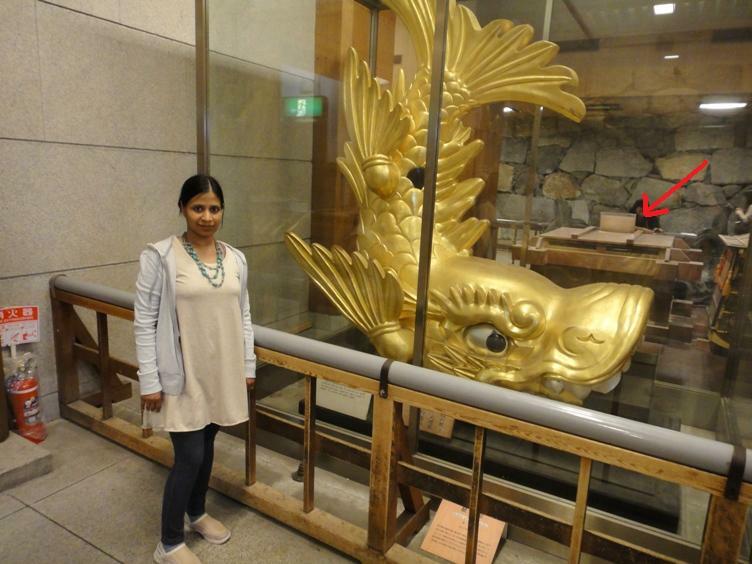 While walking along the paved pathway, we saw a replica of the female golden Shachihoko (Kinshachi) exhibited amongst the greenery inside the castle premises. 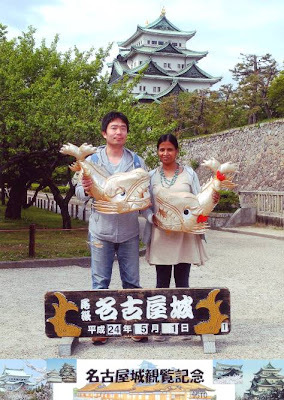 In fact, Nagoya Castle is best known for the two Kinshachi that adorns the main ridge of the castle’s roof. 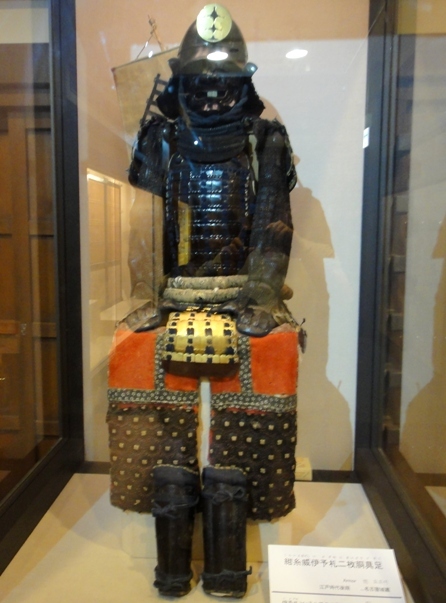 Kinshachi is believed to keep the castle free from fire and evil. 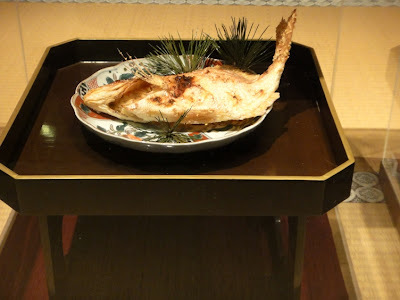 It is said that the first Shachihoko that adorned the castle roof appeared in the Muromachi period as symbol of the authority of the feudal lords. 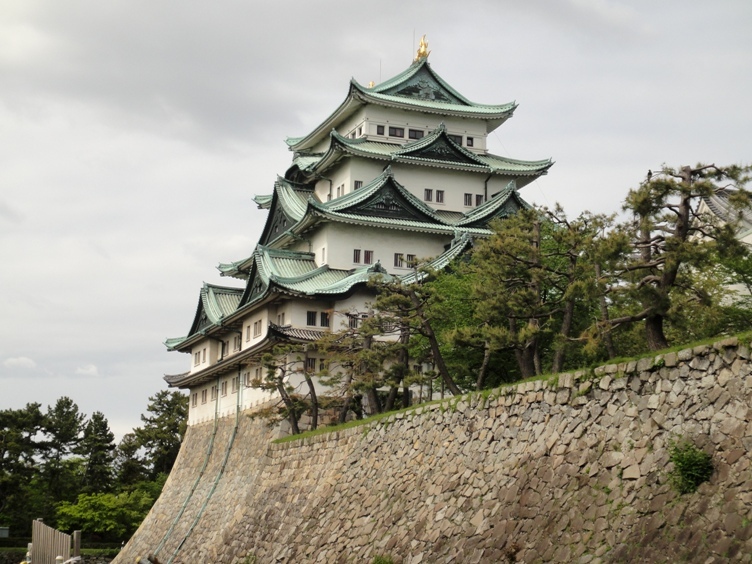 Although Nagoya Castle’s Kinshachi were destroyed during World War II, they were rebuilt in 1959. 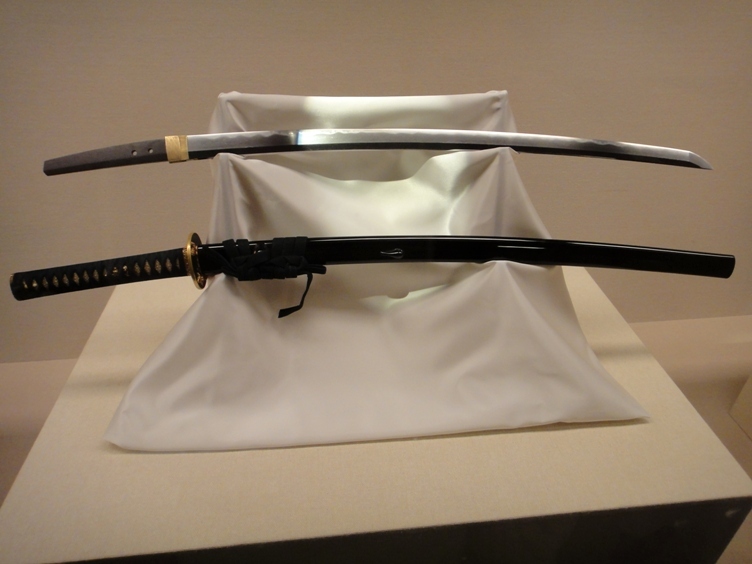 The rebuilt Kinshachi were cast in the Osaka Mint and are covered with 0.15 millimeter thick 18 karat gold plates. The male and female Kinshachi have a height of 2.621 meters and 2.579 meters, respectively. After walking north along the paved pathway for several minutes, we started getting wonderful view of the stone wall surrounding the donjons and the main donjon itself. 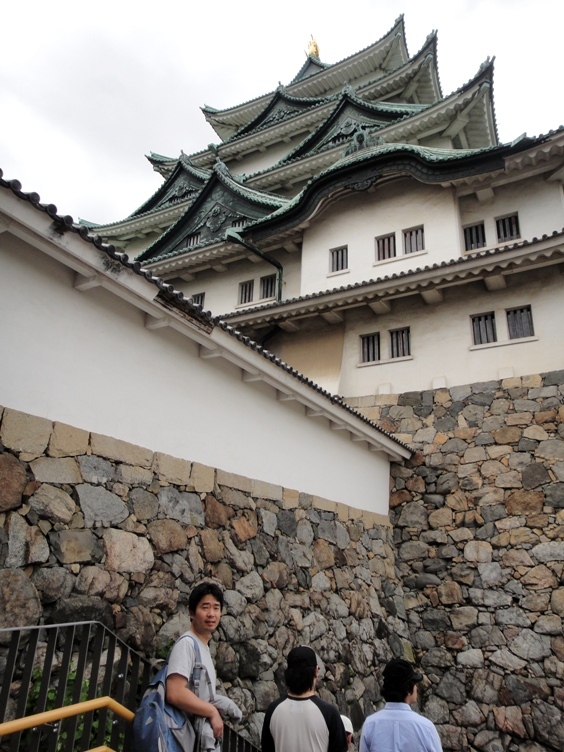 The five roofs of the main donjon along with Kinshachi on either end of the topmost roof looked stunning. 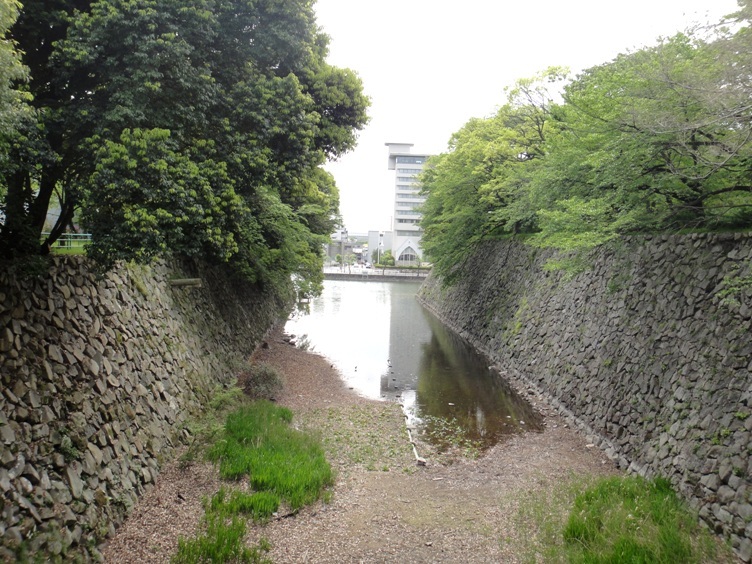 While walking along the pathway, we saw that the moat between Nishinomaru area and Ofukemaru area comes in very close to the castle wall. This is called the cormorant’s neck because it is long and thin. This was done to increase the defense of the castle. 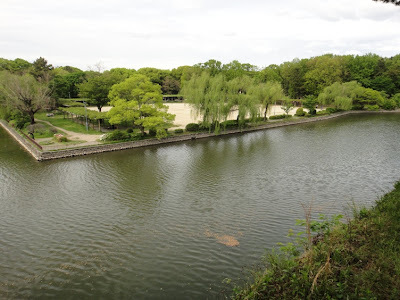 As we walked further north along the pathway, we started seeing the small donjon also. 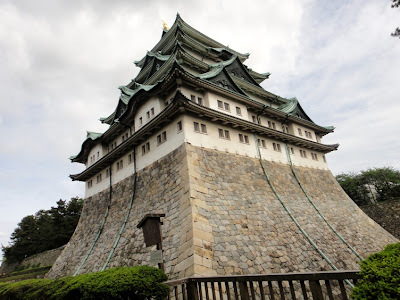 Nagoya Castle is known for its unique connected-donjon style of construction, with the main donjon and the small donjon joined by an abutment bridge. In fact, the bridge is a roofless corridor between the main and the small donjon. 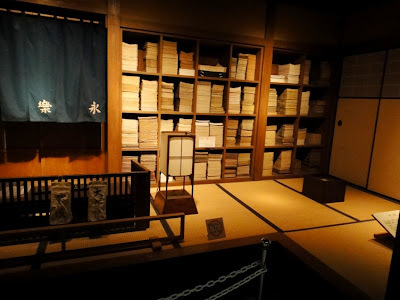 The walls of this corridor are earthen and stone. Numerous 30 centimeter long spearheads are mounted on the outer part of the west side of the corridor. This was done to ward off intruders from coming over the eaves. 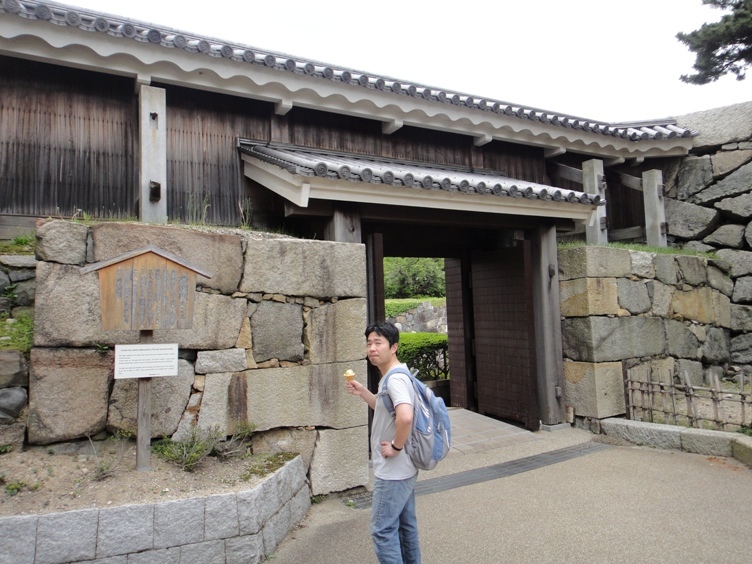 After walking for about 15 minutes, we reached the northwest area named Ofukemaru inside the castle premises. In this area, we saw many stones that made up the foundation of the original Nagoya Castle donjon tower. 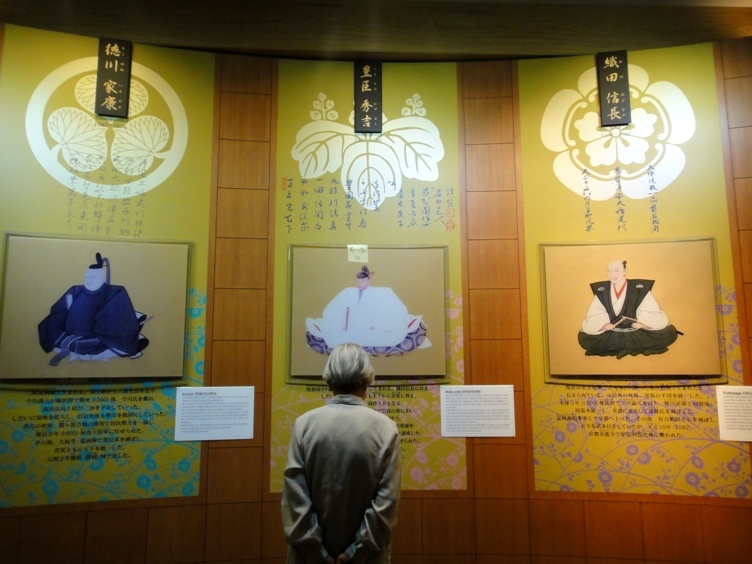 They were moved to this place when the tower was reconstructed in 1959. The original castle tower used to be a national treasure. From this northwest area, we could also see the moat filled with water surrounding the castle complex. Afterwards we walked back near the donjons and appreciated their architectural details. 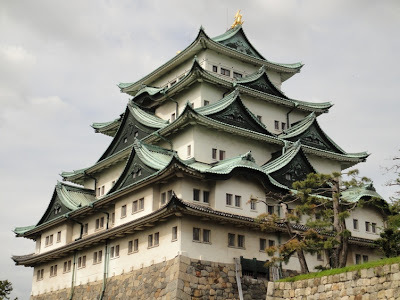 The original Nagoya Castle was constructed by twenty feudal lords who were appointed by Tokugawa Ieyasu to help with the construction. 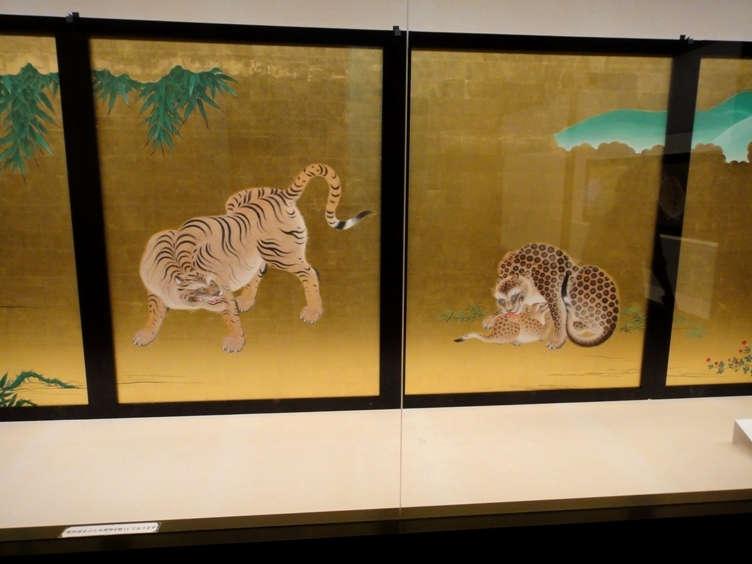 The donjons were completed in 1612. However, the main donjon, the small donjon, and the abutment bridge connecting the two donjons were burnt down during the air raids of World War II in 1945. The present main donjon having five levels, the small donjon having two levels, and the connecting bridge were reconstructed using reinforced concrete in 1959. 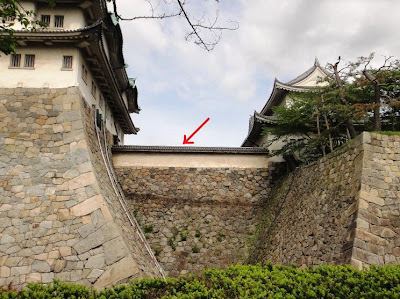 We noted that the stone walls of the donjons were curved. 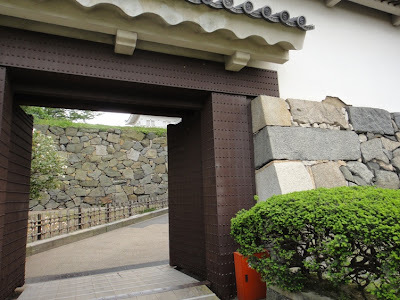 These stone walls were constructed by the technique called Ogi-kobai or fan-sloping where the upper part of the wall is curved outward like a fan. 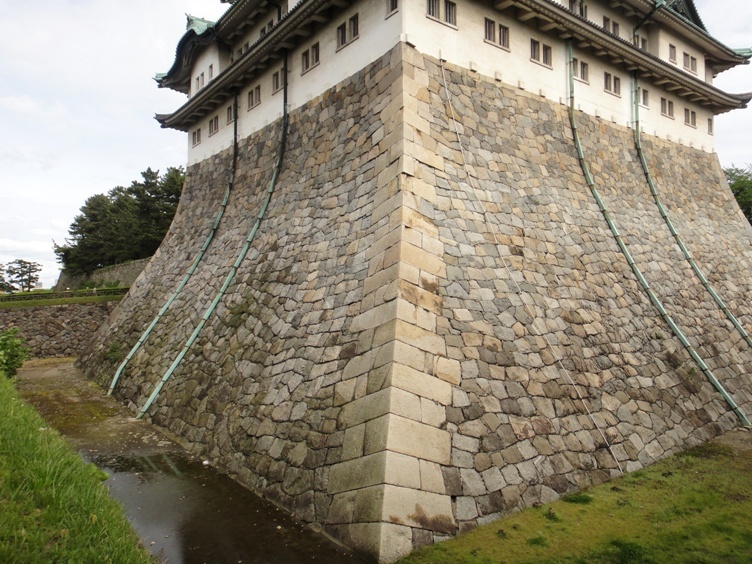 The fan-sloping technique was used to prevent swelling by curving the middle portion of the wall inward, thereby balancing the stone weight against the pressure of sand and earth within. We took several photos of the main donjon from various angles and positions. 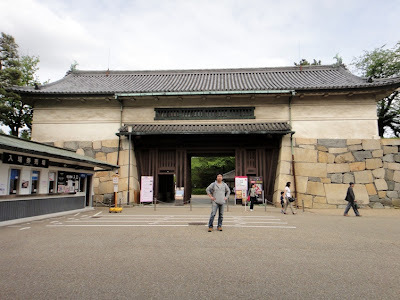 Next, we entered inside the Hommaru area through a gate named Fumei-mon located on the northern side of the wall surrounding the Hommaru area. This gate used to be always locked securely and therefore it is known as ‘the gate that never opens’. The wall around this gate is called a ‘sword wall’ because spearheads under the eaves warded off intruders. The gate was destroyed during the air raid in 1945 and was reconstructed to its original form in 1978. On entering inside the Hommaru area, we got a perfect view of the small donjon, the connecting corridor, and the main donjon. 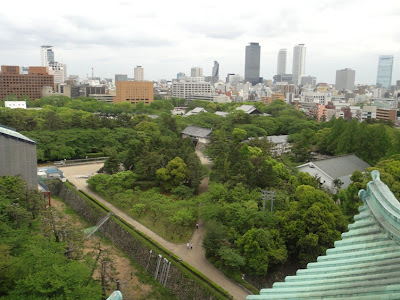 We climbed up the stairs that leads to the small donjon. 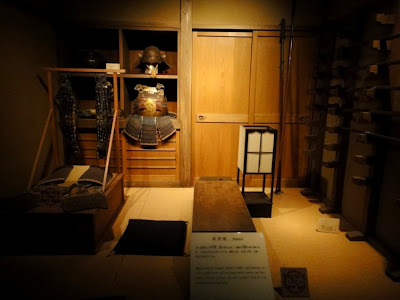 We walked only a few meters inside the first floor of the small donjon, and then turned to our right and walked along the roofless connecting corridor. From the corridor we got a wonderful low angle view of the main donjon. We entered inside the main donjon which serves as a modern museum. We entered the basement of the main donjon where we saw replicas of Kinshachi and Ogonsui (golden water) well. 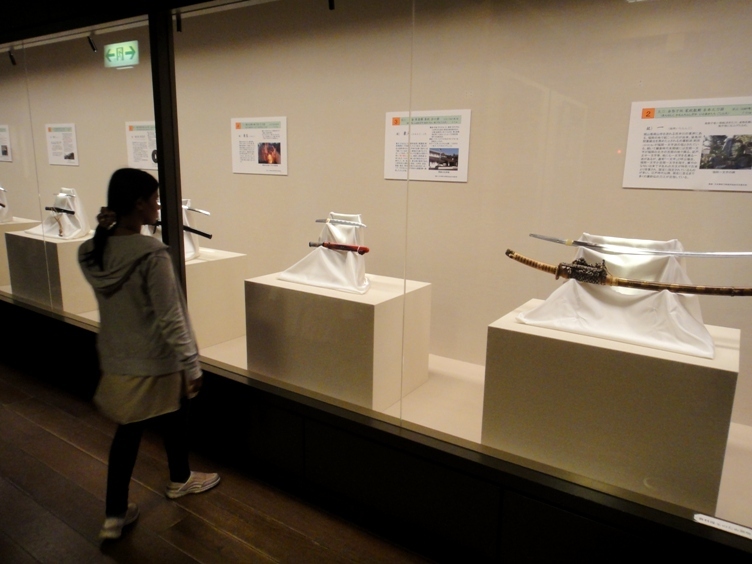 We also saw a model of a litter (vehicle) named Norimono that was used as a mode of transport by the Owari Tokugawa clan. I am standing next to the replica of Kinshachi. Structural model of Ogonsui well is seen in the background (marked by red arrow). We climbed up the steps inside the main donjon and reached the first floor. Here we saw a 1/20 scale model of the entire castle complex including the donjons and the Hommaru Palace. We also saw an exhibit of swords and their accessories that were privately endowed by Late Kishi Shinhatsu and later donated to the castle by Kishi Setsuko. In addition, there is a gorgeous exhibition of murals and screen paintings of the Hommaru Palace. 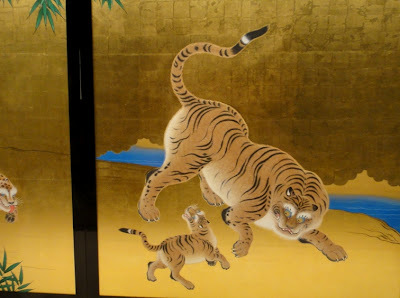 Magnificent decorations painted by the Kanou School adorned the walls of the alcoves and sliding doors in each room of the palace. 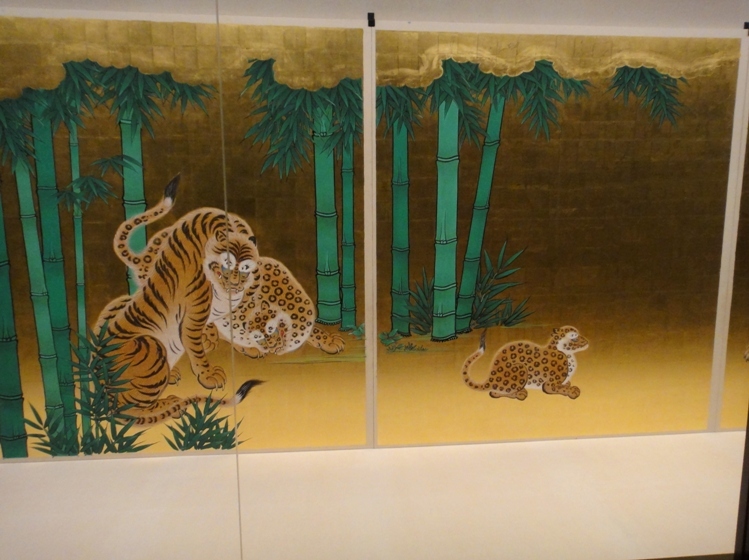 Some of the paintings, such as those on the sliding doors which survived the destruction of the palace during World War II, are designated as important cultural assets. 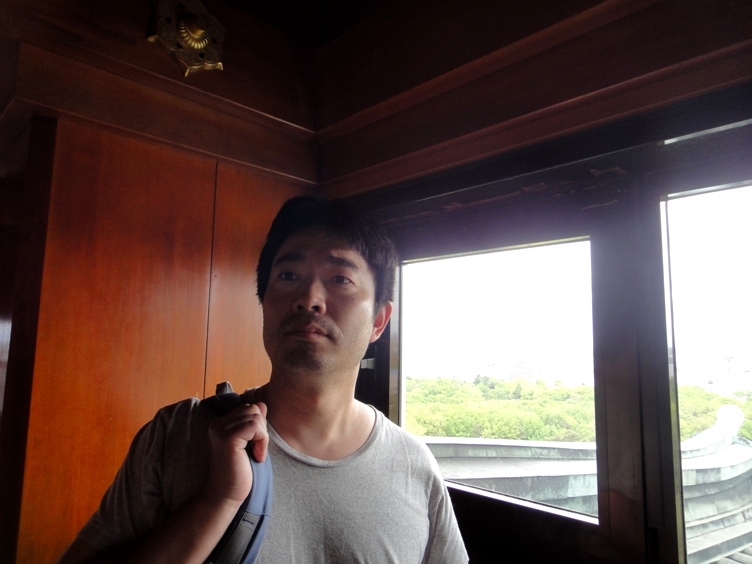 We climbed up to the second floor of the main donjon. 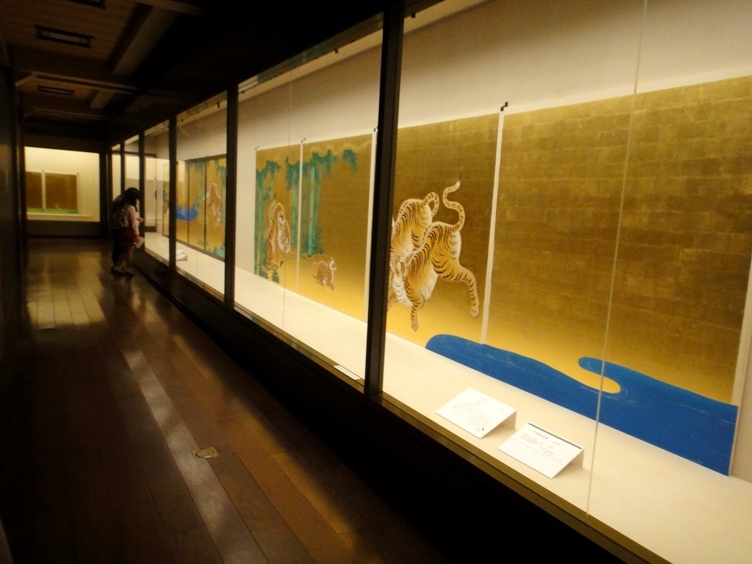 This floor is usually closed to the visitors, except when special exhibitions are held. Next we went to the third floor which has an amazing reproduction of the castle and town. We experienced a typical day of the castle lord and his town people. 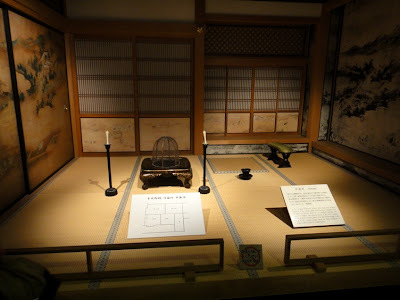 We saw a replica of a room named Taimenjo. In the original Hommaru Palace, this room of the lord was located innermost of the various public rooms. It was a reception room for daily and political affairs and for informal meetings. 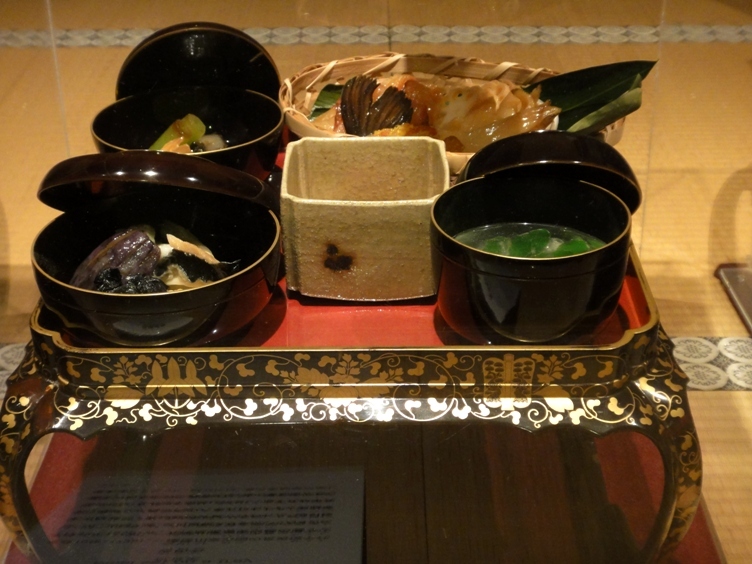 There is a replica of another room where the lord was served his meals. 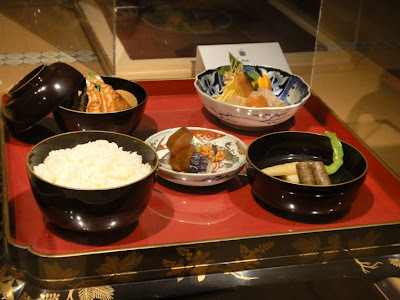 The typical meal sets served to the lord are displayed in this room. The displayed food items made of plastic look so real. Next we saw a kitchen room named Daidokoro where meals served to the lord and clan retainers were cooked and prepared for serving. 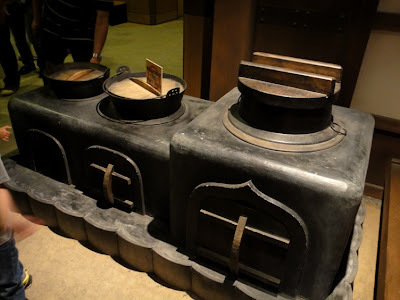 Various sizes of baskets and containers, inner shelves filled with cooking implements, and Kamado stoves are displayed in the kitchen. 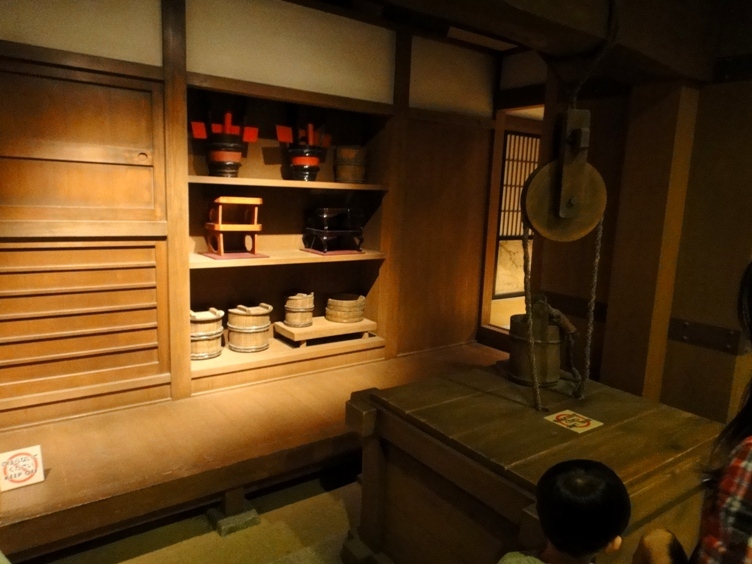 We also saw reproduction of a few shops of the castle town. There is a replica of a bookstore called Honya with display of many books. 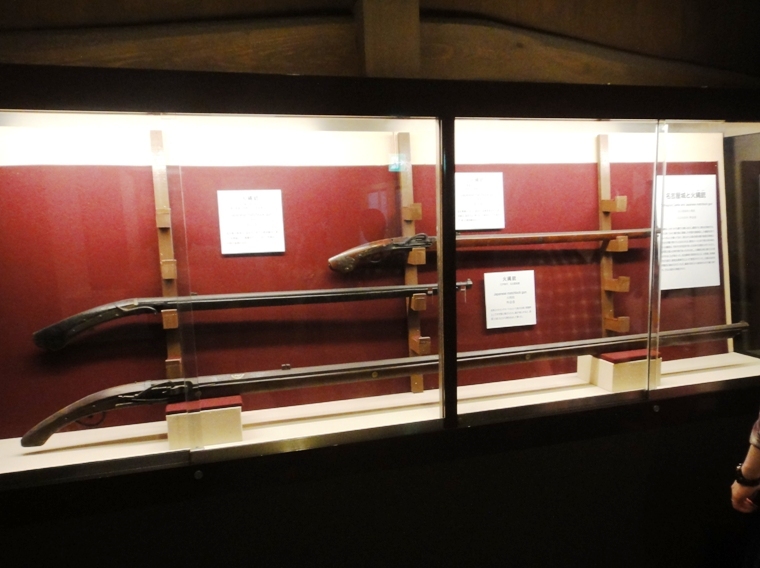 There is a replica of another shop named Buguya that sold old weapons, helmets, saddles and harnesses, and metal goods. 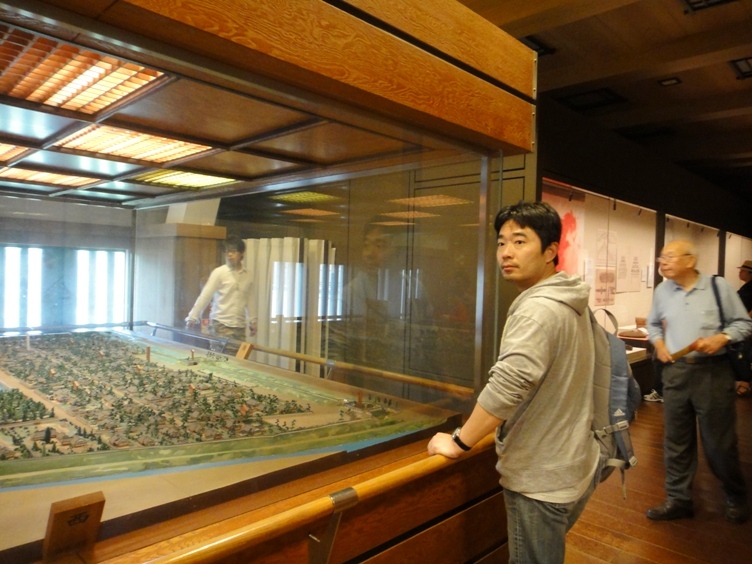 We loved viewing the reproduction of the castle and town at the third floor. Next we went to the fourth floor of the main donjon. Here we saw displays of armor, helmets, swords, and harquebus guns from the Nagoya Castle collection. Next, we climbed further up the steps and reached the fifth floor of the main donjon. We saw huge panels depicting the history of Nagoya Castle as well as the detailed information about the three historical heroes of Nagoya, namely Oda Nobunaga, Toyotomi Hideyoshi, and Tokugawa Ieyasu. 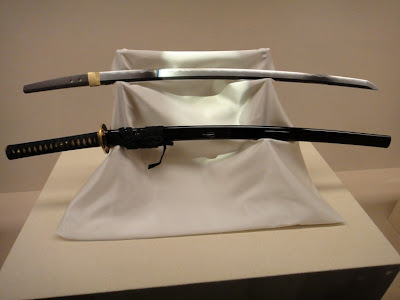 They were the greatest men in Japanese history and are known as the three unifiers of Japan. 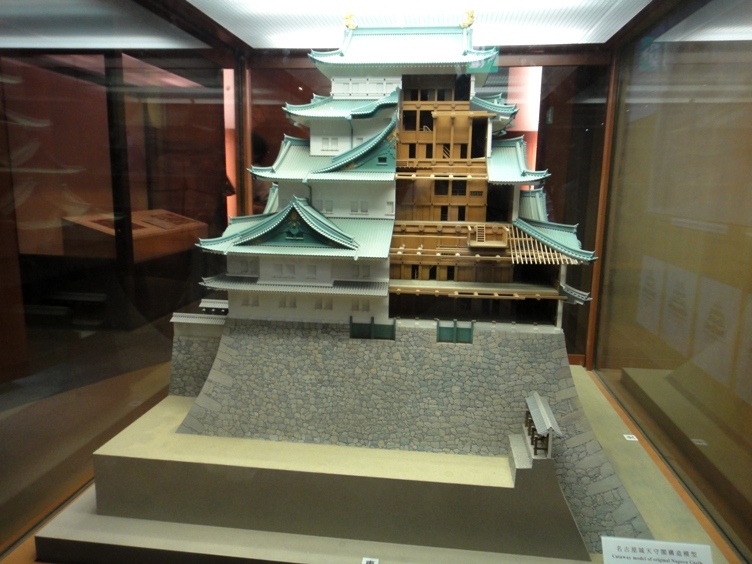 We also saw a 1/50 scale cutaway model of the original Nagoya Castle. There is also a fantastic full scale model indicating how the workers transported stones for the construction of the stone walls of the castle. We can see several workers pulling a rope tied to a stone for the stone walls. In fact, we can also try pulling the rope to get a feeling of the hardship faced by the Edo period castle construction workers. While walking around this floor, in one corner we saw a magnificent full scale replica of Kinshachi. 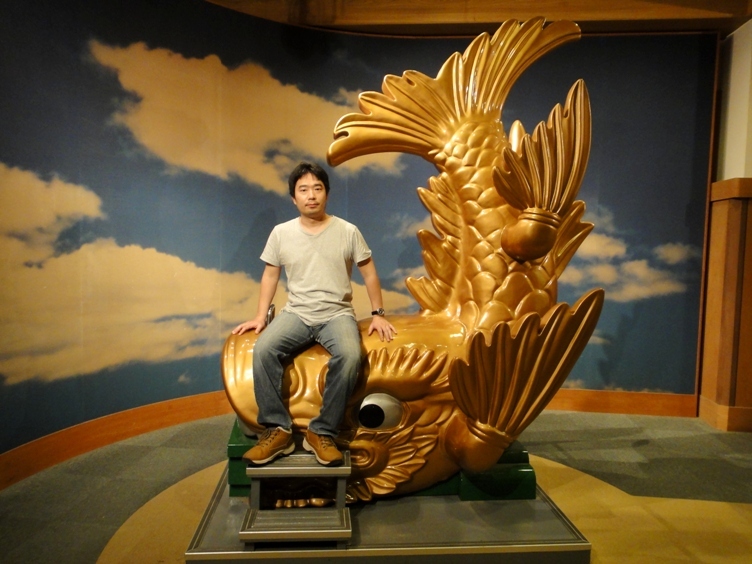 We can have a seat on Kinshachi and have our photo taken. 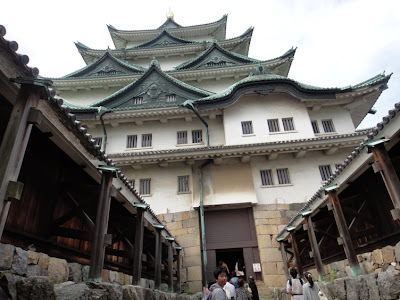 Entry is not allowed to the sixth floor of the main donjon. So we climbed up the steps and went to the seventh floor which is the topmost floor and has an observation deck. 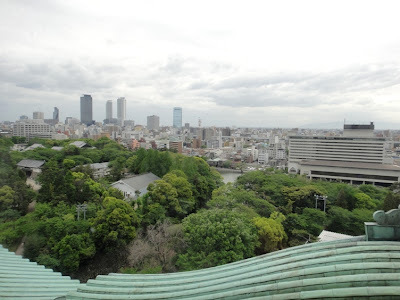 From the deck, we got beautiful views of the castle grounds and outer lying areas including downtown Nagoya. 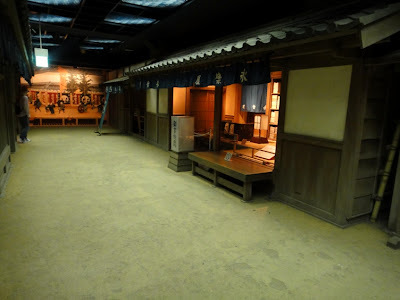 A small souvenir shop is located on this floor from where we bought a pair of cute couple dolls. At this point, we finished the tour of the main donjon. 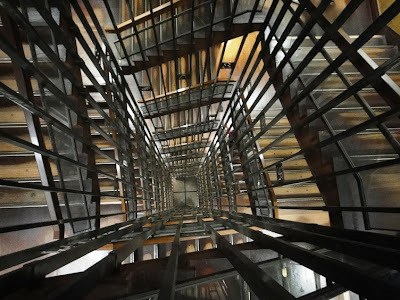 As we were about to head down the stairs, I casually looked down from the topmost floor and felt very dizzy probably because I am a bit afraid of heights. 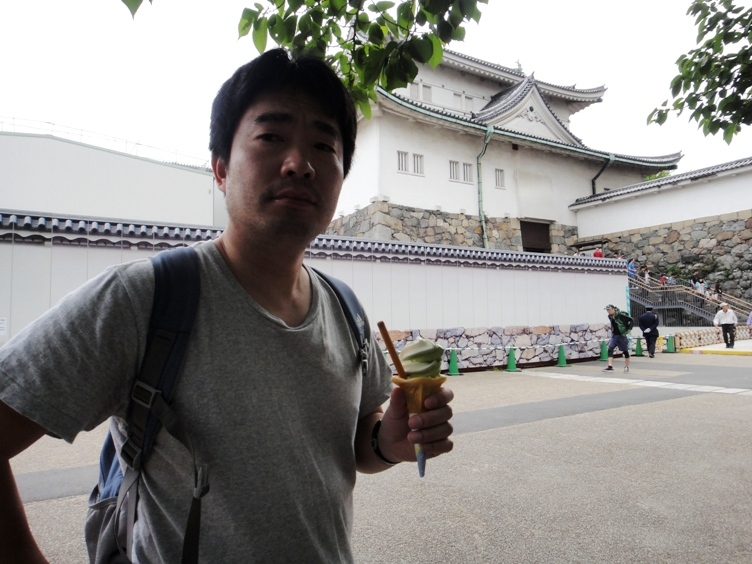 After coming out of the main donjon we had softcream and relaxed for some time. 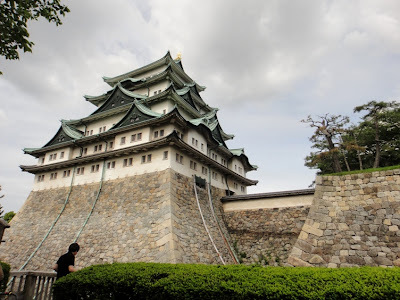 While walking towards the exit of the castle complex, we reached an observation point that is most favored by the visitors for clicking photos of the main donjon. Hubby and I had a professional photo of us taken along with the main donjon in the background. 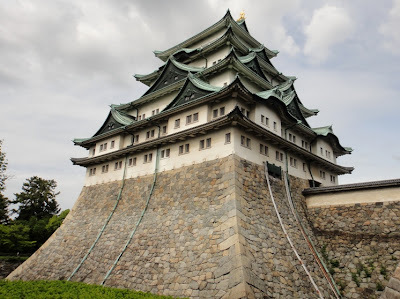 We loved visiting Nagoya Castle and enjoyed the architectural and historical details of the castle. Very interesting post. The pictures are nice. 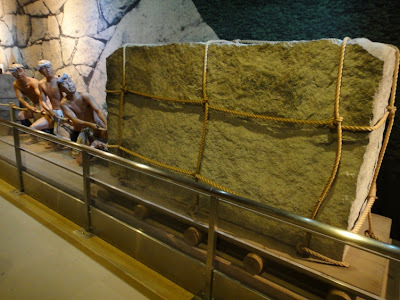 I liked the picture of the workers carrying the stone. Thanks Tes for liking the post and pictures. Thanks Laya for liking the pictures. I tried pulling the rope attached to the stone. 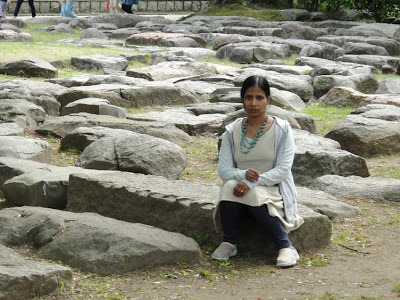 But the stone is too heavy. Yes Shiana, we loved the castle and the visit was worth. Hello. 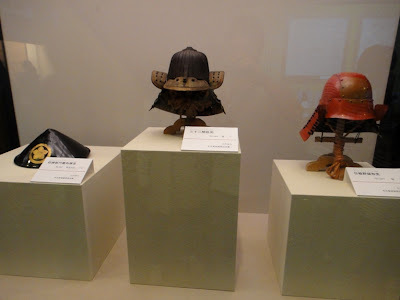 I just came across with your post on Nagoya Castle. Very informative. 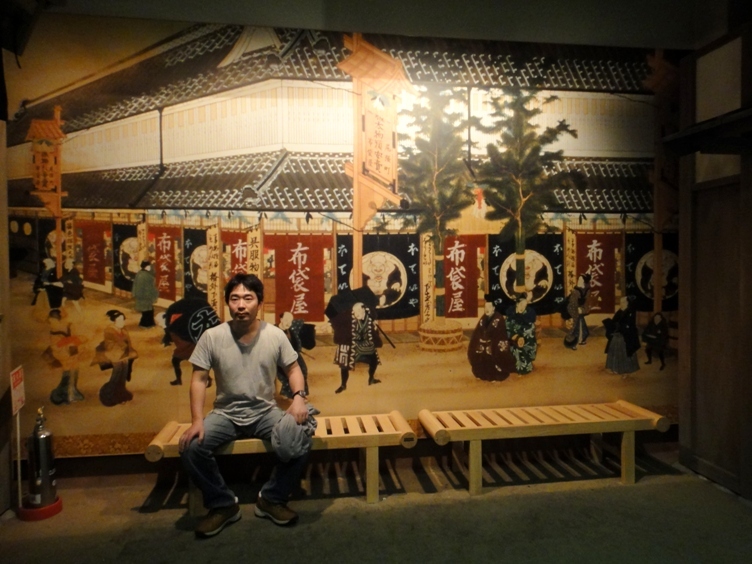 I learned lots of vocabularies, as well. The pictures are all beautiful. Thank you for sharing. Thank you for your nice comment Mekkan.